A packed launch event at the city’s historic St Mary’s Guildhall heard of a year ahead packed full of events to promote and celebrate sport in all its forms. Lord Mayor of Coventry Cllr John Blundell, and Cabinet Member for Sport Cllr Kamran Caan, told sporting organisations and community leaders that it would be a year to remember – not just a celebration, but a year that would help build a better, healthier Coventry. 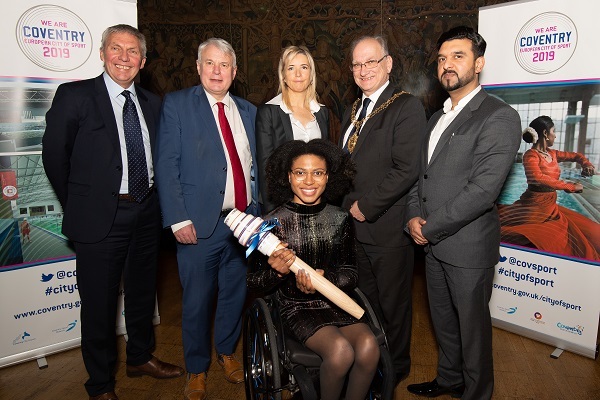 Coventry para-athlete, T34 100m World Record Holder and winner of BBC’s Young Sports Personality of the Year Kare Adenegan was also at the launch event in her new role as patron for the European City of Sport year. The year coincides with Coventry’s Year of Wellbeing and is designed to help people across the city get more active and enjoy sport. Events will help promote physical and mental health and wellbeing and will range from celebrating top professional sport to park runs and Sunday league matches. The overall vision for the year is ‘to promote and celebrate, in every community, the benefits of sport and physical activity, and to be the catalyst for a fitter, healthier city in the future’. The year will build links between sport and culture as the city continues it build-up to its year as UK City of Culture 2021; and support work to improve wellbeing, including creating a cleaner, greener city and getting people involved in community events. It will also highlight the opening of new facilities and initiatives such as The Wave waterpark. Lord Mayor Cllr John Blundell said: “Our time as European City of Sport will help us build a stronger city and stronger communities for everyone. That is why the title means so much to us, and why we are so looking forward to the next 12 months. “We are going to put on a fantastic programme of sports, health activities and culture that will show everyone what a great city we have. Cllr Caan added: “This year is about promoting and celebrating sport and physical activity in all its forms. “It will tie in with our Year of Wellbeing and the build-up to our year as UK City of Culture 2021 to introduce new and innovative approaches to sport and wellbeing. “We all know the links between physical activity, health and quality of life and happiness. So if we can use this year to make the people of our city healthier just think what that will mean for Coventry. A number of takeover days have been planned to help fans at events find out more about how to get involved. The next event is at the Coventry Blaze game against Guildford Flames on Sunday, when the City of Sport Team will be highlighting the opening of new facilities and initiatives and letting fans know about planned events over the coming year, plus other fun activities throughout the evening. Fans will even get the chance to skate with the players after the game and get some autographs and selfies. To keep up-to-date with all the latest news and events, visit the City of Sport webpages, where you can also sign up to receive a regular e-newsletter.